designed by Paul Conrad (right). 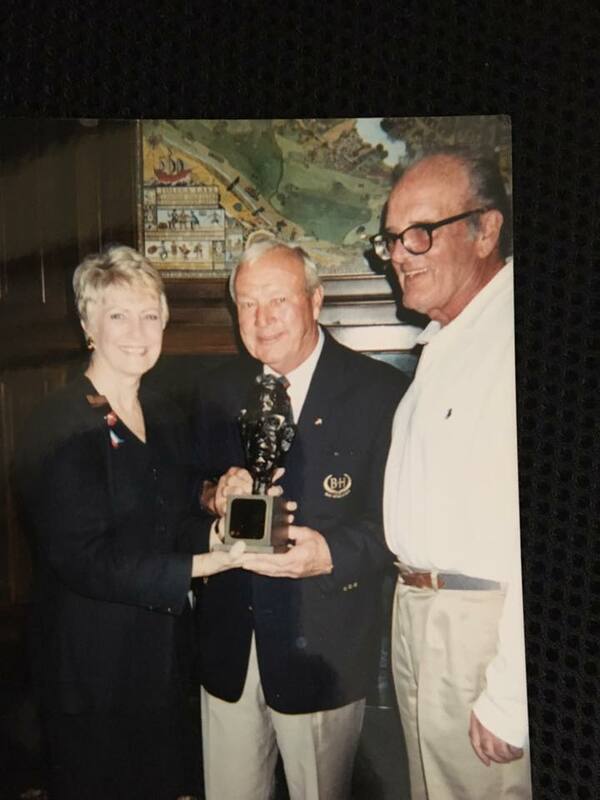 LA QUINTA — We always knew Arnold Palmer would be playing golf til they had to cut the shoes off him, or have an iron lung waiting for him at the 18th green. Even if there weren't a senior tour, Arnold would be on a golf course. Palmer and golf were synonymous. Arnold American, I used to call him. Arnold without a golf club in his hand was as out of place as John Wayne without a horse, Ruth without a bat, Carl Lewis on a bicycle. An offense against nature. He turned golf into a heavyweight fight. He didn't play a course, he slugged with it. Toe to toe. Sometimes, it was Dempsey-Firpo. The thing about Palmer was, he kept getting up. Other golfers had failures. Arnold had catastrophes. Anybody can hit a golf ball off a fairway. Arnold hit 'em off rocks in the Pacific Ocean, out of parking lots, over trees and through jungles. There was no such thing as an unplayable lie for Palmer. Watching him play golf was like watching Dempsey fight, Kelly dance or Mays go after a fly ball. It wasn't that he had a gorgeous swing — he slashed at the ball like a guy beating a carpet. But he was as strong as truck-stop coffee. He had forearms like a blacksmith's, wrists like wagon tongues. And he never saw the golf shot that could make him flinch. Arnold would try to par Rhode Island. No, birdie it. He went after a course like a caveman. He made a two or a 12. He hit the ball in places where he had to chase the seals to play it or lift tree limbs and beer cans off it. He was at his most dangerous from off the pace. You never wanted Palmer in your rearview mirror. He never lagged a putt in his life. He never laid up or used an iron off a par-5 tee. Palmer never tried to outsmart a course, he just charged it. He didn't want to win on points, he wanted the knockout. He wanted to hang it on his wall. He was like Dempsey with his man on the ropes, Tilden at match point. He was the greatest long putter I have ever seen. He treated 40-footers as though they were tap-ins. "When he got it within 20 feet, you felt like saying, 'That's good,’ " Dave Marr used to say. The truck drivers loved him. The public loved him. Other golfers had galleries. Arnie had an army. If he goes to Heaven, God better have a handicap. Or Arnold might not stay. He didn't make golf. Golf made him. But he lifted it out of the stockbroker-banker constituency and opened it to the public. He came along just as television did and it was a marriage made in golf heaven. Hogan would have sold cars in any era. So would Snead. But Palmer brought in the people who sat in center-field bleachers at Ebbets Field or in the balcony at St. Nick's Arena. And they didn't come to see Good Housekeeping golf by some meticulous ex-Walker Cupper or Brigham Young graduate. They came to see Palmer with his shirt out, cigarette smoking, ball in the high rough and needing a three to tie for the lead. You wouldn't put his swing in copy books. It was a wild slash, the kind you see at midnight at the driving ranges, but it hit the ball long and straight. Arnold won the U.S. Open at Denver in 1960 by driving the par-four, 346-yard first hole. He won 60 PGA tournaments and two British Opens. A guy's a superstar today if he wins a dozen tour events. The 40-foot putts don't go in anymore. Sometimes, the four-footers don't go, either. He has to hit a four-iron where once he hit a six. The holes get longer, the greens get smaller but the magic is, he's still Arnold American, Captain Golf. Maybe not the leader in the clubhouse anymore but the leader in the marketplace. Americans cling to their icons, probably because we have so few. We get our royalty from sound stages and playing fields. When they set up the Diners Club Matches down here at the PGA West Nicklaus Resort course this weekend, they chose 32 playing pros from the regular tour, 16 from the women's tour and 16 from the senior tour. But when they paired Arnold Palmer and Jack Nicklaus on a seniors team, they immediately relegated the rest of the cast to extras. The galleries, the autograph hounds, the guys with notebooks and microphones crowded around. It was a pairing made in golf heaven. It was 1960 again. Golf permits the preservation of legend this way. It was like seeing Ruth and Gehrig again, watching Dempsey and Gene Tunney climb into the ring, cheering the 1959 Bob Cousy-Bill Russell Celtics. When Arnold and Jack teed it up, they represented 130 tour victories between them, to say nothing of five British Opens and three U.S. Amateurs. They towered over their sport as few athletes have in history. Arnold Palmer didn't make golf, he just put it on Page 1. He made it as exciting as a Rocky movie. Arnold on the charge on a golf course was cut-to-the-chase stuff. The public adored him. It still does. Even though he has to say "what?" a lot. Even though the eyes need bifocals to read the greens and the hair is white and the old familiar slash looks like a window shade going up, Palmer is as charismatic as any American hero from Buffalo Bill to Sitting Bull. There might have been better players, but don't bet on it. Arnold is as famous for his megafailures as his 60 triumphs. Once, in a final round of a U.S. Open, he had a seven-shot lead with nine holes to play. To lose that takes concentration. The next day, no one wrote about the winner. "How I Lost the Open" was going to be the title of my essay. I thought it was terrible but it wasn't. It was Palmer. Part of the mystique. He hit a ball in the water on No. 18 Friday, which seemed typical. Arnold out on a rock again. But Nicklaus saved the par and, when the match went into overtime, the team of Nicklaus and Palmer won. The tournament organizers were overjoyed. Television promptly rescheduled the next day's competition to put the seniors' event on. The word spread. The galleries grew. We were all young again. When Nicklaus and Palmer won again Saturday, dismissing Chi Chi Rodriguez and Jim Dent, 4-and-3, the Diners Club four-ball had a chance to become a historic event, which is already a Palmer specialty. If he and Jack can eliminate Raymond Floyd and Dave Eichelberger today, there should be a plaque on the 18th green commemorating the event. Only three personalities rated the description The King in our generation. One was Gable, the actor. Another was Elvis, the singer. And the other was Palmer, the golfer. Arnold in the water or in the trees is still a bigger story than anyone else on the green. Golf is lucky there was a Palmer, and Palmer concedes he was lucky there was golf. But in his new book, A Personal Journey, Arnold writes, "Some people think of me as just plain lucky and I can't argue with them. I would like to say, however, that a man might be walking around lucky and not know it unless he tries." Palmer tried. He gave luck two shots a side. And still won four ways — the nine, the 18, the match and the life. Reprinted with permission by the Los Angeles Times. Jim Murray Memorial Foundation, P.O. Box 60753, Pasadena, CA 91116—————What is the Jim Murray Memorial Foundation? The Jim Murray Memorial Foundation is a 501(c)(3) nonprofit organization, established in 1999 to perpetuate the Jim Murray legacy, and his love for and dedication to his extraordinary career in journalism. Since 1999, JMMF has granted 104 $5,000 scholarships to outstanding journalism students. Success of the Jim Murray Memorial Foundation's efforts depends heavily on the contributions from generous individuals, organizations, corporations, and volunteers who align themselves with the mission and values of the JMMF.